Walk to Remember took place today and I am so thankful that I was asked to share words of encouragement with those who gathered. Here is my speech. I hope it touched those who attended the Walk but can also live on to encourage others who read it here on my blog. Hello, my name is Alexis Marie Chute. Thank you for the honor of speaking to you today. A month earlier, my husband and I had learned that our son was diagnosed for death. An ultrasound revealed a large tumor wrapped around Zachary’s heart like a tailored coat. This tumor grew as a part of a rare condition and despite other manifestations; we were told his heart would fail. I shared this diagnosis with that sweet young woman at Walk to Remember and we embraced in condolence and empathy. Together we cried for our children while baby blue and pink balloons still floated overhead. I did lose Zachary. Two weeks after that conversation, in the usually happy moments following birth, Zachary’s heart did fail and he died in my arms. When my son died my hopes seemed to die with him. The loss was heavy and the depression that followed was as deep and as dark as outer space. I lost my way, in every way, and my sorrow leaked through my eyes without relief. Yet – my son has never let me go. Despite the fact that Zachary never opened his eyes or even made a sound, his short life has profoundly impacted every part of me. I will always be his mother, he will always be my child and I hold his life in my heart which will beat on in remembrance of him for the rest of my life. Just as we are changed by the lives of our children no matter how brief their presence in the womb or this world; we are also transformed by their death. On this sorrowful journey fraught with uncertainty, what I do know for sure is that our children are alive and with us even before they are born. They are first conceived in our hearts through our hopes and plans; the day dreams of family vacations, musings about personality type and whether they will enjoy art or football or both. From the instant the pregnancy test radiates two pink lines; we fall in love with our child no bigger than an apple seed and our vision for them grows years beyond as the life we hope for plays out before our eyes like a movie. These are the ponderings of expectant parents. As our stomachs grow round with our children, these dreams take on clarity and breadth and in the beginning, we have no inclining that what we anticipate will become anything but reality. Yet even in the face of death our children live on in our hearts and never let us go. 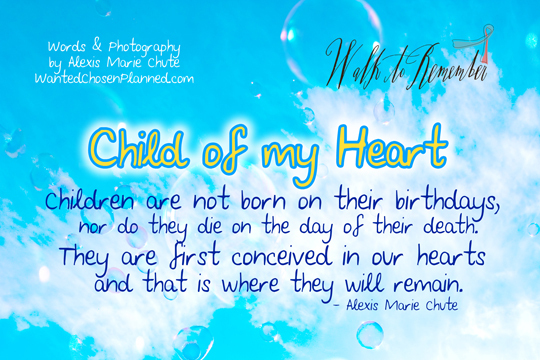 Children are not born on their birthdays, nor do they die on the day of their death. They are first conceived in our hearts and that is where they will remain. After Zachary died, my husband held our boy up to the hospital window. It overlooked a large field with a playground. He said to Zachary, “This is the world.” And thus, as parents, we entered the club often spoken about for us who have lost a child. Our club is a somber fellowship with stories of sorrow, lost dreams and cradles without children to rock to sleep. It is easy to become trapped in this sadness but do not give up the search: there is hope. Instead of fleeing the pain, embrace it. You feel deeply because of the depth of your wonderful capacity to love. In my own journey I have wagered with grief, battling it over unanswered questions of ‘why’. I’ve read the books, gone to therapy, attended the groups, actively done the work of mourning, and through it all – realized that my son saved me. I care more, love deeper, dream bigger, work harder, mother better. There is hope for our fellowship. On the special days where I take a long pause amongst life’s rush to think about my son, I wonder: Are our children in a club as well? I like to think so. I imagine they meet in an enormous playground, the kind gazed upon by wide eyes and gaping mouths. Cherry red slides, yellow wobbly bridges and ocean blue swings glimmer in the sunlight and are comforting warmth to the touch. Our children are ageless and call each other by name as they play in the unending day. This club is not somber; there is no bitterness or anger, no sorrow or longing. The children live and are happy – as they are in our ever lingering dreams for them. There is no recess bell to call them begrudgingly indoors, no curfew. Just play, only smiles and the kind of laughter that rings like wind chimes in the breeze, haunting but magical. While our children’s club sounds heavenly compared to ours, it is up to us what we make of these new lives we find ourselves within. As we stand here today, we can look to our left and to our right and feel a fellowship with the others who have gathered. There is healing to be found in this company as we journey along together. We can gain strength from those who have traveled before us and we can pass on this wisdom to those who will follow. I will never forget that woman who cried with me when I was pregnant with Zachary at my first Walk to Remember. Her love for her child is fixed in my memory and I think of her often. I encourage you today, say hello and share your story. Together let us remember that children are not born on their birthdays, nor do they die on the day of their death. 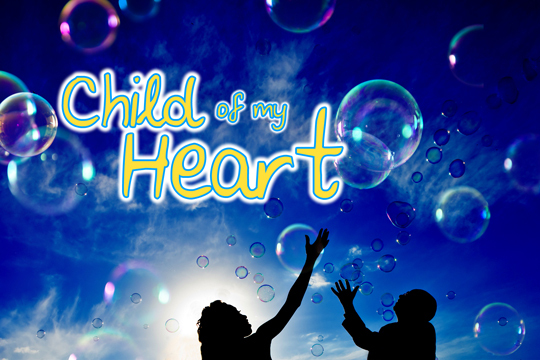 They are first conceived in our hearts and that is where they will remain, as children of the heart. We were delighted to be at Walk to Remember and share this special day with you and your family. It was a beautiful dayi in so many ways! It was made even more special with your thoughtful and inspiring speech. Zachery will certainly always live on in our hearts. Thank you for the courage to share your story to help all if us deal with our own losses. I’m glad my words at the Walk struck a chord. Thank you for celebrating and remembering with me. Your presence there means a lot. Thank you so much for sharing your story with us today. What a beautiful, yet hard day in so many ways. I agree, hard but beautiful. Emotional but worthwhile. Was this your first Walk to Remember? Your talk was touching and moving. Thank you, Amy. That means a lot to me to hear your feedback. Oh, just beautiful! I’m so sorry for your incredible loss… I can’t imagine the pain you had to wade through… STILL have to wade through. Thanks for reading Patty! You definitely have it right, the mourning endures for us who have lost a child. I greatly appreciate your kind words!